This database aims to provide researchers and policymakers with a set of country-level data in the area of wages, working time and collective disputes. It looks at both the systems that are currently in place (such as legislation or collective bargaining agreements) and some outcomes (such as the level of collectively agreed pay or working time). Short, qualitative descriptions have been added to the data to facilitate a better understanding. The database covers all 28 EU Member States and Norway and provides time series from 2000–2017. It will be updated every second year. Version 2.0, published in July 2018 includes updated figures until 2017 for all variables, as available, including in particular a new block of variables on the setting of minimum wages. Several of the wage-setting related variables were specified in such a way that they are closely related to or build upon variables contained in Visser 2015 (ICTWSS 5.0) [Note that ICTWSS 5.1 is available], so that a correspondence could be mapped. Where this is the case, similar variable names have been used (See also: Codebook for ICTWSS 5.0). The working time setting related variables closely mirror those in the area of pay-setting. The data generated on dispute resolution mechanisms drew on Eurofound's report on Collective dispute resolution in an enlarged European Union. The data on collectively agreed pay outcomes have been compiled over several years via the EurWORK series: ‘Developments in collectively agreed pay’ (the most recent being Developments in collectively agreed pay 2016). Data on collectively agreed and statutory working time have been compiled in the EurWORK series: ‘Developments in collectively agreed working time’ (the most recent being Developments in working time 2015-2016) , and they have been reviewed in the report on Working time developments in the 21st century – Work duration and its regulation in the EU. Further qualitative information on national systems of collective bargaining in the area of pay and working time, as well as dispute resolution mechanisms can be found in EurWORK's working life country profiles. For the system-related variables, Eurofound drew up a questionnaire which was discussed with some members of Eurofound's network of European correspondents in a workshop in Amsterdam in November 2015. National experts from the full network subsequently completed the questionnaire. On the basis of ICTWSS data, correspondents were asked to validate the figures provided and to give reasons in cases where they opted to use different data. An internal revision took place at Eurofound, involving further queries to correspondents, before the process for the data generation in version 1.0 was completed. The national contributors to the 2.0 version are listed in the codebook. The data will be reviewed and validated in future years, with updates planned for every second year. 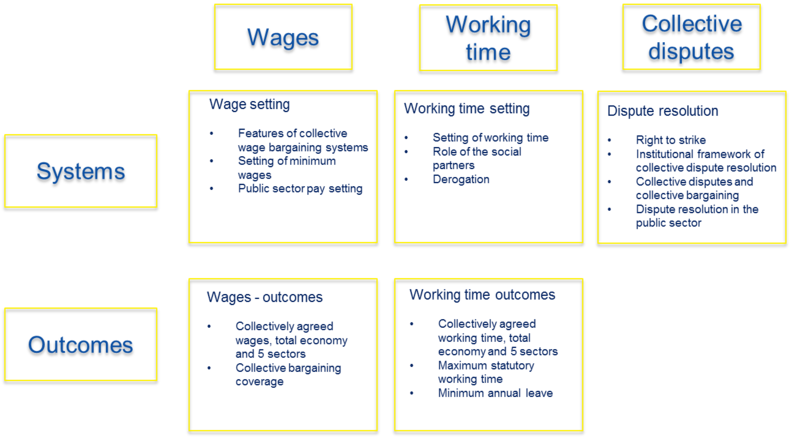 Eurofound (2018), EurWORK’s database on wages, working time and collective disputes, version 2.0, July 2018. Users of the database are invited to send their observations, comments or questions to Christine Aumayr-Pintar (cau@eurofound.europa.eu).